Rule #1: don’t take taxi’s. Madrid has both Uber and Cabify, which will save you at least €10 compared to cab fare and most drivers for either service speak at least some English. Expect to pay €16-28 for a ride from the airport to almost anywhere central. At T4, you’ll find Uber drivers down a level, to the left, and then to the left again, if facing toward the street. If that’s not your style, the metro is easy and costs €5, and there’s also an airport bus for the same price. For a major city, Madrid is extremely manageable. With great ride sharing services, and mass transit options from many parts of town, it’s ok not to stay extremely central and doing so may even save you a few bucks. 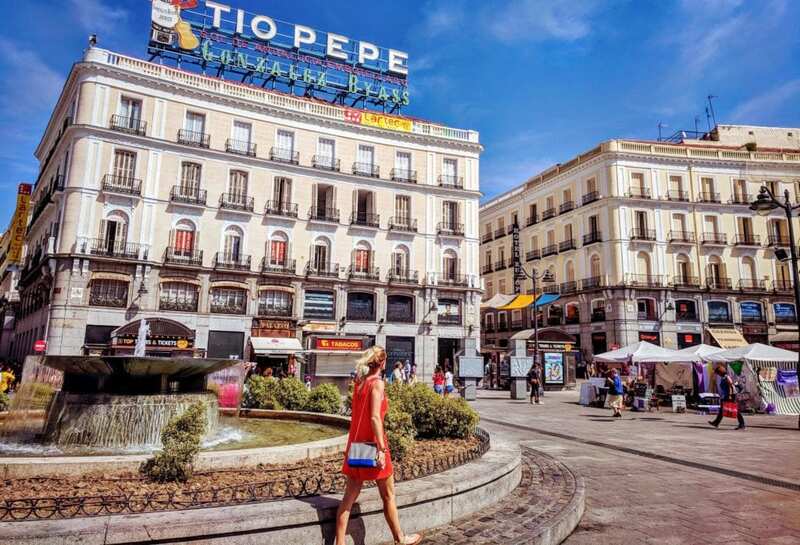 While Retiro, Salamanca and other central locations can be enviable for easy access, places like Chamartín put you in between the airport and the bustling center of town and only cost about €8 for an Uber anywhere. If you want a real treat, Chamberí is a great option with more of a local feel. And if you go Airbnb over hotel, be sure to confirm there’s air con, since that’s less of a guarantee here. With very few exceptions, if you’re eating in your hotel (and it’s not free) you’re doing it wrong. Of course, if it’s free, we’ll let you off a little bit, but Spain is famous for fantastic coffee, pastry and eggs, at extremely good prices. Many hotels will quote €18+ per person for breakfast, when you could have a feast for the whole family for the same price at a good cafe. If you’re wondering when to fit in your workouts, there’s one perfect window: morning. Unlike many cities where the bustling cafe’s open at 5:30AM to catch the early birds, Spain moves at a different pace. Many of the best breakfast or brunch spots only open at 9AM, so hitting the streets early won’t reveal very much, perhaps except a few people stumbling in from a late night. Same goes for evening, where everyone will know you’re from out of town if you show up for a 6:30PM dinner, if you can even find a place open for dinner that early! Think 8:30PM onwards. Sorry for the Spanglish! Chances are you’ll be providing plenty of that on your trip anyway. Madrid is famous for its many “mercados” or markets, where you can find wonderful tapas, wine and other foods in informal dining halls. Without a doubt, Mercado San Miguel is the big tourist favorite, and although it’s popular, it’s still easily worth a visit. Once you’ve experienced that scene, San Ildefonso and Mercado San Anton offer much more low key alternatives, with food that’s “muy bien”. It’s easy to become a wine snob after you leave Madrid, or realistically anywhere in Spain. The price to taste ratio is better here than almost anywhere on earth, and the house wine at your local restaurant back home, wherever home is (unless perhaps you live in Italy) will pale in comparison. If you do love wine, be sure to experiment with wines you won’t often find in most shops back home, and not just focus on the ever popular Rioja. Regions such as Ribero Del Duero can offer an even more affordable alternative to popular Rioja’s, while grapes like Garnacha, Verdejo, Albarino, Monastrell and others will delight the palate in the beautiful sun. A good glass runs around €5, with the fine quaffing stuff just a mere €8 in many tapas bars. Few paintings in the world rival the emotions and fame of Guernica, the iconic Pablo Picasso painting depicting the Nazi bombing of Basque country. Like most tourists, you may be thinking that to take it in for yourself, a trip to the world famous Prado is in order. Wrong. Unless you’re a huge fan of early artwork from the likes of Goya, Velasquez, El Greco or Rubens, a trip to Reina Sofia may be more up your street. Not only is the price of admission at Reina Sofia about €5 less than the Prado, you’ll get to see Guernica and many more contemporary works. After a lovely stroll through the Prado or Reina Sofia, a breath of fresh air is just what you need. Right next door you’ll find Parque El Retiro, which is the “Central Park” of Madrid and an absolute must for any trip. It’s beautiful, it’s peaceful, and unlike the botanical garden it borders, it’s free. Yes, we’re saying it may be worth saving those €6 earmarked for the botanical garden, putting them toward a great glass of wine instead. Madrid is hilly, but it’s a great city to bike. If you want to save on Uber or Cabify fare while getting in some extra sightseeing, joining the BiciMad bike program can be a great move. Like many bike share programs around the world, you can unlock the bikes remotely and drop them off at one of the more than 300 locations around the city. Full info can be found here. What’s your best tip for Madrid visitors? Previous ArticleHave Other Airlines Played Right Into Norwegian Airlines Hand? My number one tip for visiting Madrid would be to not go in August. I go there for work a few times a year, and in August everyone who can leave town does so. Many businesses will close down for the month so everyone can go to the beach instead of staying in the city. If you need to go there in the summer, the end of June or early July would be my recommendation. It will still be warm, but nothing as bad as August. Even cheaper than the Metro or Bus into the centre is Cercanias Railway (Red C Logo) costing €2.70 one way. It takes 15-20 minutes and is really frequent from Madrid Barajas T4. Ideal for Charmartin Railway Station, Nuevos Ministerios (InterContinental Hotel) Recoletos (City Centre) and Atocha Railway Station. Buy one way tickets from Cercanias ticket machines located inside the airport adjacent to the platform access. If you have a long distance Renfe Ticket from Charmartin or Atocha then this usually includes one way free aboard Cercanias into the city centre or back to the airport, just scan the barcode on the Renfe train ticket and your complimentary Cercanias ticket will drop out of the ticket machine. Great prices for BA Club Europe (And Avios availability) aboard BA460 & BA461 from LHR. Usually B777 or B787 equipment as these are predominantly used for Cargo obligations. T4S is a pain, so allow extra time – about 20 mins to/from Cercanias, Metro or any of the other terminals. However the Iberia Lounge in T4S is superb, located inside the Duty Free Shop, and more than makes up for the inconvenience of departing from T4S. Why no love for the Prado? I’ve visited museums in London, NYC, Paris, Chicago, and Washington DC, and the Prado outdid them all. We spent an entire day there – you need at least 30 minutes just in the Hieronymous Bosch gallery, and another 1/2 hour in the Goya Black Paintings gallery. We’re going back to Madrid in a few months, and the only thing on our “to do again” list is another day at the Prado. I think the Prado should be on every traveler’s bucket list!